Former Manchester United player Ian Rush has responded to Mohammed Salah, the team's top scorer, for the penalty shoot-out during the team's games. 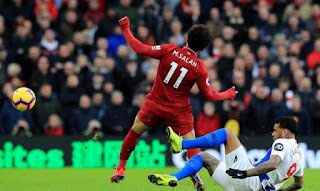 "Mohammed Salah is not deliberately falling, he is a faithful and professional man, he is not deliberately falling on the ground," Rush told the Liverpool Echo newspaper. "The fact is that he is subjected to strong interference from the defenders, and he is a very fast player and many of them can not catch him, which makes them panic and make mistakes against him." "I think he is being unfairly criticized. Look at what happened in Bournemouth. He was subjected to violent intervention, but he stayed on his feet for his desire to continue and register." "He was the best player in the world, I wonder how he did not exist in the perfect squad, from his point of view he is better than Messi and Ronaldo in 2018." "At the beginning of the season, things were difficult for him. The clubs were trying to isolate him by relying on two players to watch him, but using him in depth was a genius idea that has become better and more complete." "At the level of personal numbers he may not be able to achieve what he achieved last season, but if he scored 30 goals and Liverpool managed to win the title would be a better season for him." "People talk about Torres and Suarez. They were one of the best players but without going on for a long time, I want Mu (Salah) to stay longer than them to become a true legend of the team."